NEW YORK—Suspicious after many patrons noted the hollow thunking noise produced by knocking on the building’s exterior, a group of forensic architects confirmed Friday that the Solomon R. Guggenheim Museum, long an architectural mainstay of Manhattan’s Upper East side was, in fact, a forgery. “It seems like a legit Lloyd Wright at first, but the colors are a little dull. 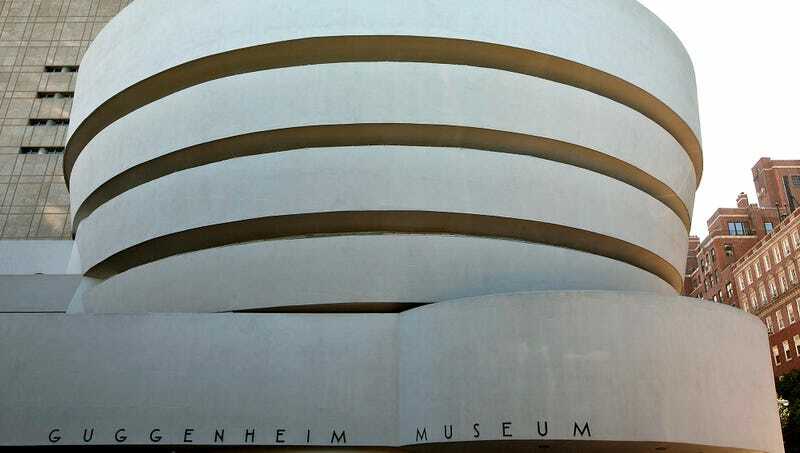 The original ‘Gug’ has four sections in the cylindrical part instead of only three, and if you go around in back, you can see an entre wing is missing,” said architectural historian Rupert Montgomery, who further noted the cheap plywood construction and the fact that the roof of the knock-off Guggenheim, unlike most of Frank Lloyd Wright’s creations, does not leak. “We compared this current ‘Guggenheim’ with some older photos and realized the switch happened about 2012, which is when modern American impressionist museums began fetching huge sums on the black market. The real Guggenheim is almost certainly in some Saudi’s private collection by now.” Montgomery recommended that cities always keep an eye on their major landmarks, especially during the tourist season.